Don’t Forget…Our Annual Free Shipping Offer and Other Promotions!!! Just a reminder for those who haven’t found a perfect gift for that special someone, ActiveWatches is still offering free shipping on all of its watches. Okay, okay, I can hear you saying to yourself, “Big feakin’ deal. Every Internet merchant is offering free shipping in this economy.” Fair enough, but we’re also offering 10-15% discounts on many of our watches. Just click on the 10% and 15% off links on ActiveWatches’ homepage. So, hurry up before this offer gets posted on Wikileaks and we don’t have any watches left! Hey, Cyber Monday may be over, but ActiveWatches’ deals aren’t. From now until Christmas, enjoy 10% off and free shipping. It’s the best deal we’ve ever extended to the general public and it happens only once a year. So take the ActiveWatcher’s advice and visit ActiveWatches.com before its inventory runs out like a cheap flat-screen at K-Mart. Just enter ACTIVE10 at checkout. WINTER SALE – 10% OFF OUR ENTIRE PRODUCT LINE! Just because it’s getting colder outside doesn’t mean it’s time to stop being active. And don’t even try to bring up the excuse that it now gets dark at 5pm. We here at ActiveWatches.com believe in staying active throughout all seasons. And we got the timing gear to withstand both the cold and dark conditions associated with a dreary winter. To help you out even more, we’re offering 10% off our entire line of watches. This offer is available for only a limited time, so take advantage of it before it gets warmer and the days get longer. Just enter WINTER10 at checkout. Time’s running out for ActiveWatches’ summer sale!!! Get 20% off any watch on ActiveWatches.com. It’s a great deal. We swear. Check it out yourself. What’s the catch, you say?! It only lasts until this Thursday, July 1st. So you better hurry up and purchase your summer watch today!!! 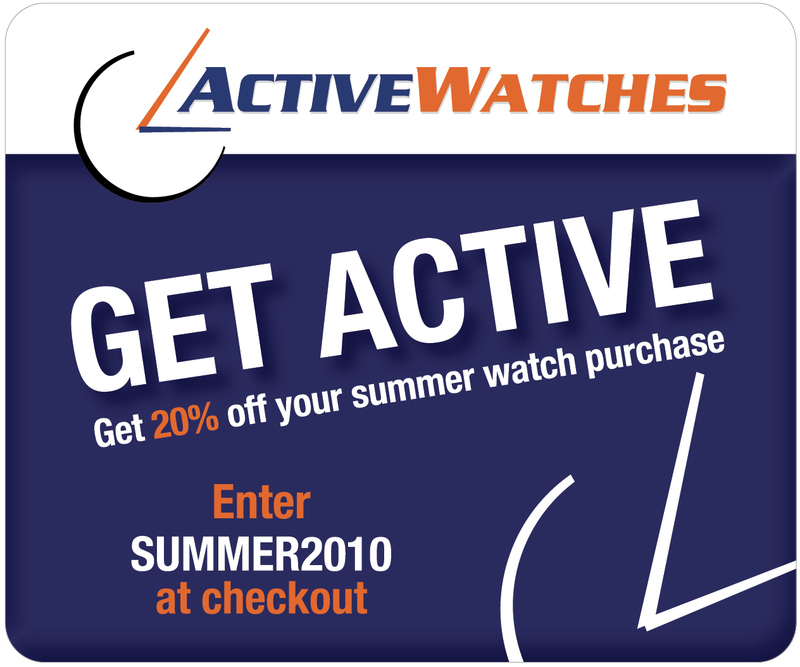 ActiveWatches’ Summer 2010 Sale is On — 20% Off!!! The official start of summer means only one thing — the official start of your active season. So it’s time to upgrade your active gear by purchasing a new watch through ActiveWatches’ summer 2010 sale! Log-on to ActiveWatches.com to get 20% off any of our watches. Just enter SUMMER2010 at checkout. Whether it’s getting in shape, looking fit, feeling great — there are endless number of reasons to get active this summer. And there’s no doubt a watch will help you do that (as if I had to remind you). Log-on today. This offer will expire before you realize this active season’s over (July 1, 2010). Also checkout our new Facebook page. Click to subscribe to this blog, receive notifications of new posts by email, and maybe even get a special discount offer from The ActiveWatcher!